Want to catch more redfish and snook? Check out these tips to fishing the backcountry on a windy day before a cold front. Want to see one of the best ways to target redfish, snook, and trout during the winter? Then check out this backwater creek fishing trip! Enjoy! This club report shows a dissection of the backwater creek that I explored including tips on how to most effectively plot out an exploration trip. Want to catch loads of fish from a SUP? Then check out this new post where Bri Andrassy joins us to discuss standup paddleboard fishing, tips, and tricks. This hidden lake fishing trip shows what I find to be some of the most fun types of trips to take because it combines the thrill of exploring new territory along with the fun of fishing. This fun video shows some cool footage of the trip and explains how you can plan these trips too. Are you looking for tips on kayak or paddle board fishing in Florida? This video shows the types of areas to target & top lures to use in St. Pete, FL. Paddle board fishing is one of the most rewarding types of fishing out there, but it can be the most frustrating when not done properly... click for tips. 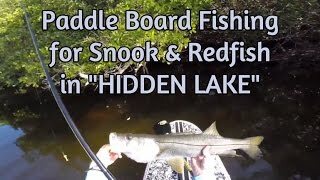 Want to learn some of the best fishing tips to catching Snook and Redfish in the winter on a paddleboard or kayak? Then check out this video tip. Looking for inshore fishing spots in Tampa? Well check out this post because it shows a great spot for snook, redfish, and trout that is easily accessible.